Violent clashes have broken out in France after yellow vest protesters took to the streets of the French capital for the ninth straight week. Scuffles broke out around the Arc de Triomphe in Paris as tear gas and water cannons were deployed by riot police on Saturday. Around 32,000 people turned out during yellow vest demonstrations across France, including 8,000 in Paris. France's interior ministry said that more than 100 people were arrested in the capital. More than 80,000 police were on standby to supervise the demonstrations, most of which to date have turned violent. France's President Emmanuel Macron has so far struggled to find a solution to the crisis as he faces a plethora of demands. 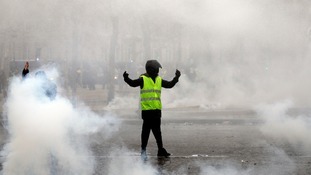 The protesters' demands range from the re-introduction of France’s wealth tax, called the ISF, on the country’s richest people to the implementation of popular votes that allow citizens to propose new laws. Thousands also marched Saturday in Bourges, in central France. 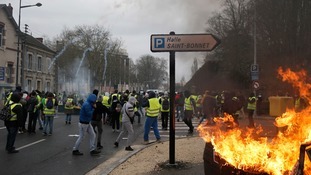 Some scuffles broke out when people threw projectiles at police and set fire to a rubbish bin in the small, picturesque streets of Bourges but most protesters walked peacefully on the town's wide avenues. Repeated scuffles broke out between protesters and police near the Arc de Triomphe monument.